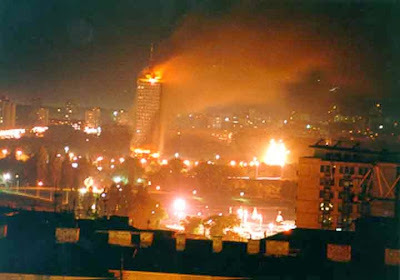 On February 14-15, the Kosovo Serbs conducted a referendum that withdrew consent from the quisling regime in Belgrade to sell them out and recognize the abominable "Republic of Kosovo". Response from Germany (speaking for the EU, no less) greatly resembled Berlin's reaction following the March 27, 1941 coup against the Yugoslav government that had signed a pact with Hitler. Jumping to please their overlords, the Belgrade quislings ordered their special border police (gendarmerie) to attack the Serb civilians last night, dismantling several roadblocks and cutting off alternate approaches to the province. The assailants were masked and wore no insignia, but the government media confirmed this morning that they were, in fact, gendarmes acting on government orders. By doing so, they basically forced the besieged Serbs to use the NATO/EU/controlled "customs crossings" manned by "Kosovian" police. Serbs in Kosovo are surrounded on all sides. All alternate routes towards inner Serbia have been blocked. Our official government is negotiating with the so-called authorities in Pristina. They are negotiating on our behalf, but we have no idea what they are negotiating away. All roadblocks on alternate routes to inner Serbia have been removed by masked men with no insignia. We do not know who they were. The lives of 150,000 Serbs in Kosovo are in danger. We are blocked from receiving aid. We are denied freedom of movement. We beg Russia to raise its voice against this abuse. We beg Russia to help us, because no one else will. If someone doesn't act, the occupiers will get their wish: Kosovo will not be Serb anymore, because there won't be any Serbs left in Kosovo." Think about this the next time you hear someone in the West preach about democracy, human rights, and intervening to help civilians being abused by their government. Here are civilians, peacefully defending their rights, liberty and property, being systematically abused - not just by their own government (and this is true whether one considers "their" government to be in Belgrade or in Pristina), but by the so-called international community (EULEX, KFOR) as well. But because the abused are Serbs, and the abusers are Albanians, Belgrade quislings and the "international community," that's supposed to be OK.
Well, it isn't. And while Russia may be a bit busy fighting off a NED-spawned "revolution," something tells me Moscow knows that as well. I understand that diplomacy is the art of saying "Ow!" while stepping on someone else's foot. And I understand that a diplomat is an "honest gentleman sent to lie abroad for the good of his country" (Wotton). But even so, there ought to be a line somewhere. On behalf of President Obama and the people of the United States, I am delighted to send best wishes to the people of Serbia as you celebrate your National Day this February 15. The United States and Serbia share a long history of friendship and cooperation based on mutual interest and mutual respect. Today, we stand with Serbia as you work toward European Union integration, and we will continue to support your progress until this goal becomes a reality. I look forward to continuing to strengthen our relationship and deepening our work together in the coming year as we promote stability and prosperity in the region and around the world. As you celebrate your National Day, know that the United States is a partner and friend. I wish all the people of Serbia and Serbians around the world a peaceful and a prosperous future. You're most certainly not delighted, Madam Secretary, and it's simply offensive to pretend otherwise. The U.S. and Serbia had a long history of friendship and cooperation. That history ended on March 23, 1999. And not because of the Serbs, either. Likewise, there is nothing "mutual" about the current relationship between Washington and the quisling regime in Belgrade. The successive U.S. administrations have repeatedly demonstrated that only the U.S. is allowed to have interests, and only the U.S. is entitled to respect - while anyone else in the world, Serbia included, is not. To speak of "promoting stability and prosperity" anywhere, while chiefly involved in bombing and occupying countries around the world - or seeking to overthrow their governments through astroturf "popular revolutions" and staged rebellions - surely has to be the pinnacle of cynicism. Especially since the U.S. has done all those things to Serbia over the past 13 years, making it decidedly less stable and prosperous. If these are the actions of a "partner and friend," who needs enemies? Serbia's Foreign Minister is in Washington today, and he will smile and nod and shake hands and pretend everything is all right. It isn't. And unlike him, I'm not afraid to say it. As for those who are missing the whole "National Day" reference, today is the anniversary of the first Serb uprising against the Ottoman rule (1804), as well as the anniversary of Serbia's first Constitution (1835). The quisling regime celebrates it as "Statehood Day" - something they themselves know nothing of. And apparently, neither does Madam Clinton.